The woman's head was covered with a sack, her hands were tied and she was tethered to the ground – while a group of turbaned, bearded men hurled rocks at her, breaking her bones and then crushing her skull. According to reports in the press, she had been walking unescorted and was presumed guilty of adultery. The barbarity, allegedly perpetrated by the Taliban in the Federally Administered Tribal Areas (FATA), was shown on Dubai's Al Aan television. The same footage was televised by a private Pakistani channel on Sept 28 and the story also featured that day in the local print media. There was no reaction from civil society, no politician demanded that the government bring the criminals to justice, no resolution was passed by parliament expressing concern over the outrage, no statement emanated from the president or the prime minister condemning the incident, and the atrocity faded from public memory because the woman was a nonentity and did not matter. The adage "justice delayed is justice denied" is not necessarily true. In the case of the unknown woman in Fata, as in other instances, the skewed Taliban concept of Islamic justice was as swift as it was brutal. The stringent Quranic evidentiary requirements for proving adultery were set aside and the accused was condemned for a crime she had never committed. Around the time that the video footage of the stoning incident in Fata was aired on television, the MIT-educated Pakistani cognitive neuroscientist Dr Aafia Siddiqui was sentenced to 86 years in prison by a US federal judge. On Feb 3, she had been convicted on various charges, including attempted murder, armed assault, and using a firearm against US nationals. After the verdict, she exclaimed: "This is coming from Israel, not from America. That's where the anger belongs." There was stern public and government reaction. Demonstrators took to the streets, chanted anti-US slogans and burnt the American flag. Prime Minister Yousuf Raza Gilani described Dr Aafia Siddiqui as a "daughter of the nation," but did not think it worthwhile to make a similar pronouncement about the woman who was so cruelly put to death in the tribal areas. Equally forgotten were some 7,000 women languishing in prison, 88 percent of whom, according to the National Commission for the Status of Women, have been incarcerated on charges of unproven adultery. The nationwide display of support for Dr Aafia Siddiqui was admirable, but the law, as Aristotle believed, "is reason free from passion." This was what a few members of the National Assembly implied when they stated that the response to the sentencing should be balanced and confined to the legal aspects of the case. Some of the opinion columns also alluded to Dr Siddiqui's second marriage in February 2003 to the accused Al-Qaeda member Ammar al-Baluchi in Karachi. The latter is a nephew of Khalid Sheikh Muhammad, the principal architect of the 9/11 attacks, and a cousin of Ramzi Yousef who was convicted for the 1993 bombing of the World Trade Centre. Al-Baluchi was arrested on April 29, 2003, and could face the death penalty as he awaits trial in the US for complicity in the 9/11 incidents. However, these details are extraneous to the Aafia Siddiqui case because she was neither accused of nor convicted for terrorism. 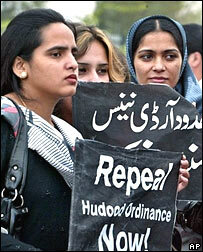 Again there was justified countrywide outcry when on April 2, 2009, the television channels aired video footage of a 17-year old girl, Chand Bibi, being publicly flogged in Swat by the Taliban because she had been spotted outside her home accompanied by a naamehram (stranger) and was therefore presumed guilty of indecency. Whatever little sympathy there may have been for the Taliban disappeared in one sweep. The Supreme Court took suo moto notice and asked for the girl to be produced before the court. However, for fear of reprisal by the Taliban, her family denied that the incident had ever occurred. This was evident from the change in the Tehreek-e-Taliban stance. Initially, their former spokesman in Swat, Muslim Khan, justified the harsh punishment on the ground that had the case been heard by a qazi (judge), Chand Bibi would have been stoned to death. Without even batting an eyelid he subsequently claimed that no such incident had taken place and the video had been doctored by NGOs as part of a conspiracy against the Taliban. The former information minister, Sherry Rehman, stated that "ignoring such acts of violence amounts to sanctioning impunity. The fire in the Swat Valley and our northern regions can engulf other parts of the country, if we do not put it out." So strong was public opinion against the Taliban that military operations against them were launched in Swat some months later, followed by a similar onslaught in South Waziristan. Chance played a role in raising Mukhtaran Mai from her ordeal to dazzling celebrity status and international prominence. Brought up in poverty and illiteracy she braved the odds in a society where women's bodies are a battleground for male honour. Her journey to fame began in 2002 when her brother was seen walking with a woman from a rival clan. He was sentenced by a panchayat (tribal council) and the punishment ordered was that his sister be raped. Mukhtaran Mai was accordingly assaulted by four men and paraded naked through the village. The government of the time, led by Gen Pervez Musharraf, remained a passive bystander till the tragedy captured international media attention. Even then, on June 10, 2005, as she was about to travel to London on invitation from Amnesty International, she was not allowed to leave the country as she had been placed on the Exit Control List. Musharraf, who was on a visit to Australia and New Zealand, admitted to the international media that the travel restrictions had been imposed on her because he "did not want to project a bad image of Pakistan." This belied an earlier government claim that she did not want to go abroad because of the illness of her mother. Subsequently Musharraf, who claimed that the motivating impulse of his government was "enlightened moderation," unabashedly stated that the easiest way for a Pakistani woman to obtain a visa was to get raped. Perhaps that was the image of the country he wanted to project. Jurists say that the law is the repository of the morals of the people. However, it cannot, by itself, generate justice, which has to be imported in its application. If the common good of all is the purpose of justice, then it must be free from political bias and anchored in the bedrock of truth. This applies as much to the trial and sentencing of Dr Aafia Siddiqui as it does to the stoning to death of the woman in Fata and the thousands of other "daughters of the nation." There cannot, and must not, be any selectivity in the public reaction to these outrages. I genuinely applaud you for taking up the topic of woman's rights. I am from India and just stumbled upon your post. I request you to keep building awareness on these basic and important issues.